As I mentioned when I featured creative mailboxes for M day, I have an ordinary mailbox. However, now that my oversize, outlandish, opulent, some might say outrageous, azaleas are in bloom they create a flower wall around my mailbox making it photo worthy for O this week. WOW! What a gorgeous azalea! You are absolutely right ! The azaleas transform your mailbox into a fairy tale object! It's gorgeous! Hope the mail carrier can still make the deliveries! Very nice natural framing of your ordinary box! Love it. Love your flower wall of azaleas, beautiful! OH Wow! It is absolutely a gorgeous photo opportunity! Wish I could pop by and take my own photo! Ohhhh, how impressive! and so beautiful!! Overload of colour and gorgeous. Azaleas are putting on a show here too, but nothing compared to yours. How old is that plant? Did you ever prune it when it was younger? Ohhhh There's so much charm in that ordinary. wow, this is probably your letter carriers favorite mailbox! beautiful! my azaleas are just starting to bloom! The flowers steal the show. 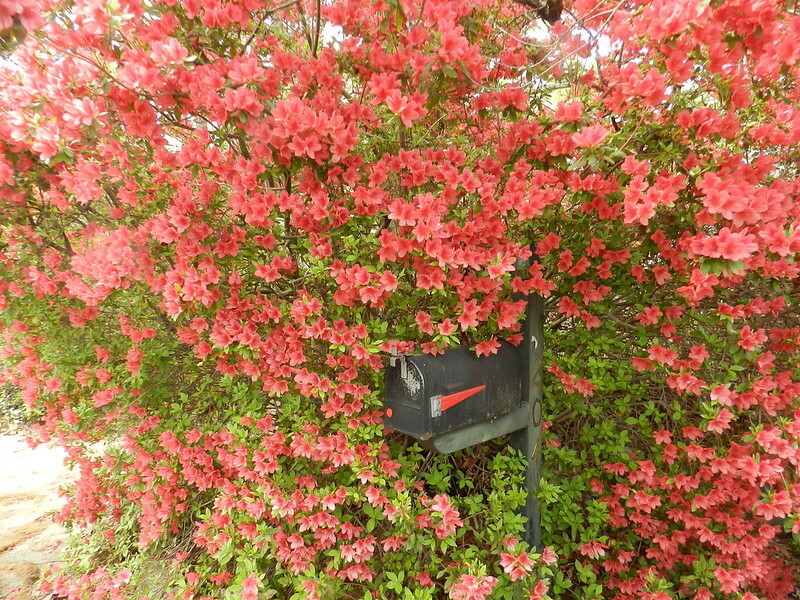 It may be an ordinary mailbox, but those azaleas give it an extraordinary appearance! Lovely!! Wow! Such an abundant Azalea! Absolutely Omazing! There is nothing ordinary about that plant (and the mailbox isn't ordinary either, because most mailboxes certainly aren't surrounded by this beauty! That's quite a display. You must have a fabulous green thumb.